Well you will be glad to know that even though I do enjoy both... the original is definitely better! And I think I would like to watch the original one again... possibly late at night when everyone else is asleep... as I had several interruptions during the movie... and I am sure that took away from the experience as well. Maybe this one will give you a little more hope for me Jon? From the director of 'The Grudge' and 'The Grudge 2' comes an eerie tale of a hotel with a terrifying history. Thirty-five years after the slaughter, a film director returns to the scene of a mass murder to recreate the gruesome killings on film. As he and his crew step into the now abandoned hotel, the cast members begin to see creepy visions and nightmares. When shooting commences, the cast members begin to suffer very familiar fates - the exact fates they are to act out in the film! This is my very first taste of actual Japanese Horror (Before now just had the American remakes to go by). The main reason I been hesitant is the fact that I do not like subtitles... I am too slow of a reader to be able to enjoy a movie that I must read. But after seeing a lot of knowledgeable friends talk so much about how great some of these foreign horror movies are I had to finally see for myself. Unfortunately I may not have gotten the best Japanese horror to start out with... as this movie was a bit confusing and on the weird side. But I have to admit... the atmosphere of this movie is remarkable. This movie had the kind of atmosphere that Hollywood movies has seemed to of forgotten many years ago! I actually felt a few decent chills from a horror movie... something I haven't felt from horror in quite a while! Even though the movie itself could have been better.. and having to pause and rewind a little several times in the movie to see what was said... I definitely see I need to add more foreign horror into my collection! With any luck I will get used to subtitles with time... and hopefully learn to read a bit faster as well. This was a blind buy for me... but one I wasn't worried about placing in the least since I am such a big fan of Stephen King movies. But I must say... this movie was even better then I was expecting... and my expectations was pretty high! The suspense was great and the effects was well done. I really enjoyed every minute of this movie! I seldomly ever give a full 5 point rating when I review movies.. as I do believe there is always room for improvement... and I stuck by this here... but this is the closest I have gotten to wanting to give a full 5 point rating since I started my marathon! Have you been keeping up with my thread? I've said just the same sentiments about The Orphanage. You certainly picked a high mark to start with because both Grudge movies are pretty tough to keep up with so I can only assume that one was as well. I'm really glad you enjoyed it. Subtitles will get easier and it helps with films like Dark Water, which has a small amount of dialogue. I am really looking forward to adding some more foreign horror to my collection now. Only problem is I still do enjoy Hollywood's films as well (not to mention my obsession with TV on DVD)... I see myself going broke in no time! An aristocratic bearing and a distinctive voice helped Vincent Price cultivate an air of sophistication and mystery. These traits made him a standout performer in 'The Fly', 'The Pit and the Pendulum', 'The Abominable Dr. Phibes' and dozens of other acclaimed films that fueled a career that spanned six decades. This is an interesting documentary on the life of Vincent Price. I have became a huge fan of his work in horror movies... but I had no idea he was involved in so much more then horror! I definitely enjoyed taking a behind the scenes look at my favorite classic horror star. This is because you haven't read the book. This movie is a bad adaptation, the feel good ending doesn't work, many characters are badly cast, some important passage of the book are not develloped enough and sorry but the CGI are not really good (the tentacles in the backstore are an exemple of the bad effects). This one was a big deception for me and a 2.5/5 at best. A young girl and her parents become the latest victimes of the Amityville curse when they are terrorized by the evil spirits living within her dollhouse in this chilling supernatural thriller. I didn't remember ever seeing this one before... but I remembered a few scenes... so I am sure I seen it. It is unfortunate that I didn't remember as this one really is only fair at best. If I would have remembered it I would have picked a different title. But that is ok... as it is not terrible... just not good either. I can see myself watching it again... just not that often. I don't like Stephen King's books and find the further away the adaptation gets, the better it is. The further he stays away from the set, the better it is too! I still have nightmares about bloody Maximum Overdrive. 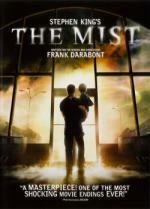 Meanwhile Frank Darabont is responsible for two of the best films from his books and, Pete included, I've not heard many bad words against The Mist. I'm really looking forward to this! Actually, Jimmy, what do you think of The Shawshank Redemption or The Green Mile? I think that fact saved me on a lot of Stephen King movies... but that is ok! You might enjoy his films in the Fox Film Noir range, Pete. Laura is a classic thriller anyway and a pretty straight role for him. But I also have Shock which is great fun and you can see the style he came known for starting to form. By the way, I know we've mentioned your allergic reaction to a five star rating before, but what film(s) have you used it on? If he says Sorority, I'm not playing anymore. I've not heard many bad words against The Mist. I'm really looking forward to this!